Taiwanese President Chen Shui-bian has defended plans to hold a referendum asking people if they feel threatened by China's military presence. US President George Bush earlier warned Taiwan against any steps towards independence, after talks with the Chinese prime minister in Washington. But Mr Chen said his "defensive referendum" was for "avoiding war". The president has said the 20 March poll would ask China to remove hundreds of missiles that are aimed at Taiwan. The US is worried the vote could be seen as a move towards independence, a view shared by China. 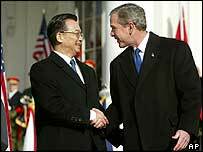 After talks with Chinese Prime Minister Wen Jiabao, Mr Bush made clear the US was against any unilateral moves which threaten its "one China" policy. "We oppose any unilateral decision by either China or Taiwan to change the status quo, and the comments and actions made by the leader of Taiwan indicate that he may be willing to make decisions unilaterally, to change the status quo, which we oppose," Mr Bush told reporters. Correspondents say his comments were the US administration's strongest statement to date in opposition to the referendum. President Chen says he wants a "defensive referendum"
But White House officials insist that criticism of Taiwan should not be seen as a "green light" for Beijing to intimidate the island with its military might. President Chen - leader of the pro-independence Democratic Progressive Party - says the "anti-missile, anti-war" referendum is aimed at asking China to dismantle hundreds of ballistic missiles targeting the island. "The Taiwanese people will hold the historic referendum on March 20, which will have nothing to do with independence nor intend to change the cross-strait status quo," he said on Wednesday, launching his candidature for re-election in next year's presidential poll. "Referendum is a normal practice in democratic countries and is the basic rights of the people which they cannot be deprived of," he said. Beijing regards Taiwan as a renegade province, but Mr Wen said China's goal was to pursue peaceful reunification with Taiwan. "Stability can only be maintained through unswerving opposition to pro-independence activities," he said. Mr Wen accused the Taiwanese leaders of "using democracy as an excuse and attempt to resort to defensive referendums to split Taiwan away from China". 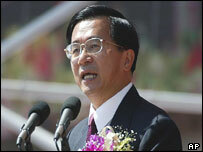 Mr Wen turned from politics to trade on the latest stage of his visit to Washington. He said relations between China and the United States showed how countries with different systems could work together. The trade balance between the two countries this year is reported to be about $120bn in China's favour. The Americans say the Chinese are managing their currency to make their exports cheaper. While Mr Wen acknowledged these concerns he did not say if China would accede to Washington's demands and move towards a more flexible exchange rate. In his comments on Tuesday, Mr Bush also expressed his appreciation of China's role in convening talks to resolve the stand-off between North Korea and its neighbours over the secretive communist state's nuclear weapons programme. "The goal is to dismantle a nuclear weapons program in a verifiable and irreversible way, and that is a clear message that we are sending to the North Koreans," he said. "We will continue to work with China and the other countries involved to solve this issue peacefully." "If Taiwan's president was stung by George Bush's rebuke, he didn't show it"